I like living in London. And this is why: I get to go to cities like Lisbon for a long weekend. I’m rather excited. It’s been a long time since I had done a city trip – probably Istanbul 2 and a half years ago. This trip has one changed feature – I’m carrying what I need in my new 30L Osprey Tempest. Well, maybe not so new, since it’s already had a showing in Northern Spain. Still it’s the first time I’m not doing the wheelie cabin bag thing. I do feel a sense of lightfootedness as I hop on the local bus to Heathrow, and then a tube to a Terminal 2. I’m flying a new airline today – TAP Portugal. It’s good. I panic slightly as I enter security. I’ve carried my electric toothbrush. Will they see this as a potential security risk and I will lose my Sonic toothbrush? I should have carried the normal one. Thankfully, all is okay. I am 2 solid hours early, so I have time to while away. I do a spot of duty free shopping. I’ve decided to kit myself with a wireless set of in ear headphones. I had fancied this on my second camino. I was tired of my headphones being caught up with the straps of my backpack. Once in Lisbon, I get some help from Information and hop on a metro to Baixo-Chiado. It is super easy. You buy your tickets from the auto-machines. A single trip costs €1.40 plus €0.50 for a stored value card. A day pass costs €6.00. The metro at the airport is the Red Line. Head towards Alameda and change to the Green Line towards Ciache do Sodre. I dropped off in the Old Town area. It took a while for me to find my hotel Hotel Borges Chiado. Lo, after I had spun around a few times trying to get Google maps to work and orientating myself to the streets, I finally realise the hotel was in front of me all along. Duh! Hubs had already checked in so I went straight to my room. I was looking forward to our stay. I had booked a nice hotel in the old area and the pictures on Booking.com was attractive. I rather fancied a room with high hotel ceilings and a window with a Juliet balcony. What I got was a room in the top floor and the toilet and shower in the room. There was a shower glass door but it wasn’t even floor to ceiling. A dingy corner window into a tiny courtyard or sunspace provided little ventilation since it sat above an air conditioner outlet unit. I was quite disappointed. Even some pensions on the camino were nicer. I really considered changing rooms. But directions and suggestions to local restaurants were met with blank looks of relative unhelpfulness. We decided not to waste our energies and simply enjoy our room for what it was and what it was not. We wandered out to sightsee and also to see what restaurants were about. But when you are tired, unfamiliar with the food, culture and general locales, it’s hard to choose where or what to eat. Suffice it to say we wandered into a restaurant which looked sorta nice but in reality was very average. Maybe even slightly below. No food photos. I had the pork alentejos which is a local dish of pork pieces, clams, paprika and coriander. Hubs had a steak something. Problem is, I think the chef isn’t very good. The meat was sliced incorrectly and so the dishes were tough and chewy. It was a very unsatisfying €45 for dinner. We were both unhappy. Room not great. Food not great. The only saving grace for the evening was the discovery of this pasteleira. 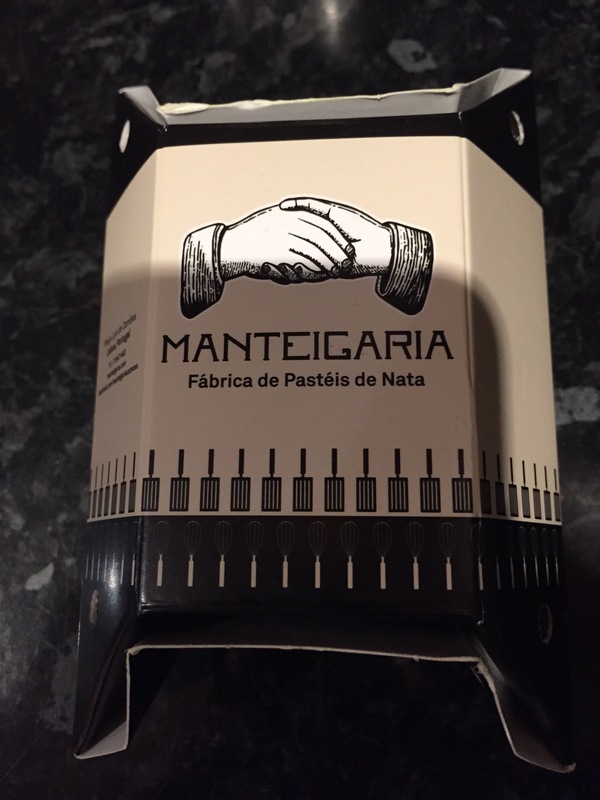 Manteigaria – a bakery that only specialised in 2 products: Portuguese tarts and coffee. Now when you have only 2 products – well, one – you get very good at it. The other product is only to help finish the tart off. Amazing, amazing, amazing. Especially when you sink your teeth into its gooey-ness about 15 minutes out of the oven. Maybe there is something to love about Lisbon after all. Does this not look delish? Shop is located on Largo do Carmo in the Chiado district. You really can’t miss it. The smell of caramelising sugar will entice you in. I agree! 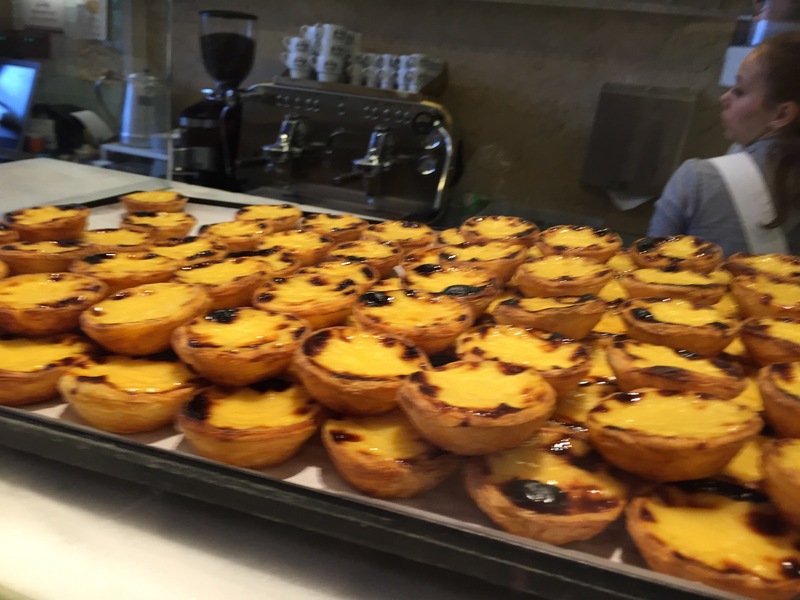 Portuguese tarts from Portugal are the only way to go. I don’t think anywhere else stacks up.